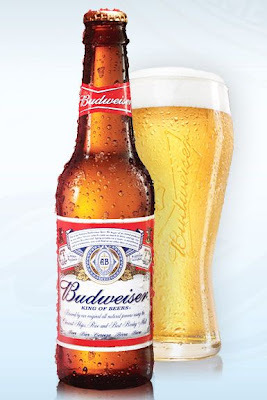 The Not So Professional Beer Blog: Free Budweiser!! Would you Drink It? Take the Poll. No, are you crazy! I am a bonafied beer snob. Bud is so bad I wouldn't even boil my brats in it. As a fellow beer snob, that was my initial gut reaction as well. However, I haven't had a Bud in long time. So if someone gave me one for free (and I had no other options), I think I'd drink it--but only for review purposes. Touche. Well said! Maybe I should do a review of Bud Light Lime. No way. I'm not wasting my calories on that. I call it a "why bother" beer. Your beer doesn't make you a stud. Well said! It's a big world with a lot of different beers. To each, his (or her) own! Thanks for speaking out on behalf of the Bud fans! People .... c'mon ... it's the KING of BEERS. The KING! It's good to be KING! Actually, the best time to order one is when you are somewhere in sections 160-171 at Busch Stadium in St. Louis. The vendor that works that section roams the aisles shouting out the best sayings ... my favorite of which is this: "Who wants to wear the crown?" That one is followed closely by this one for when you buy a Bud for your woman: "A King for the Queen!" Bud is the "King" of all beers? Well sign me up! Think I need to shut down this blog and buy a few cases of Bud Light Lime and Bud Ice!! I think that the whole Bud "givaway" is attributed to the fact that the next generation has developed a taste for quality craft brews. I think "king" means quantity, but we'll see what the future holds. Speaking of baseball games, I went to a San Diego Padres game this week.......$7.75 for a Bud or Miller and $8.50 for a Stone Arrogant B..tard. I'm so cheap, I waited for the game to be over and had a beer at the hotel. $4 for a Firehouse. That's steep for a beer, but I could justify that at a ballgame for anything from Stone. But $7.75 for a Bud? That's just wrong.